Neither Duisburg and Sand or Bayern and Essen could be separated as both split four goals down the middle as Hoffenheim claimed four against ‘Gladbach and Wolfsburg went one better against Leverkusen. Elsewhere, Bremen gave their survival hopes a boost with a win over Frankfurt as Turbine came from behind in Freiburg. Still looking for solid safety, MSV could only manage a point after a feisty clash with Sand. The hosts took the lead late in the first half through Barbara Dunst’s neat finish into the top left corner. A quick double after the break saw the visitors take the lead when first, Milena Nikolić toe-poked Nadine Prohaska’s square ball home from close range before the Austrian hammered an uncleared free kick beyond Meike Kämper. 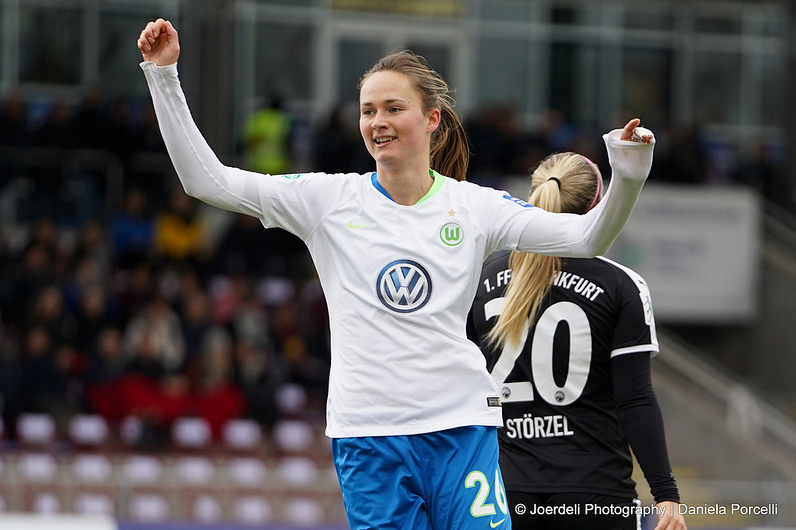 The lead barely lasted ten minutes however, as Lucie Haršányová tied the scores up once again, squeezing the ball under a diving Carina Schlüter from 12-yards. In what could have been a frustrating afternoon at the Grenzlandstadion for the visitors, Maxi Rall prised open the scores late in the first half, lumping the ball home after tenacious work from Sarai Linder. Anne Fühner’s goal four minutes into the second half left the hosts with no way back, Isabella Hartig’s low effort spilled and allowed to dribble over by Lisa Venrath as two became three. The visitors finding their fourth and final goal through substitute Annika Eberhardt, her whipped effort finding the far side of the net four minutes after her introduction. Pouncing on Reena Wichmann’s layoff, Selina Cerci claimed first blood in Bremen in the 12 minute, slotting the ball into Bryane Heaberlin’s bottom right corner. Having out-run Janina Hechler to pick up Michelle Ulbrich’s through ball, the 18-year-old let fly from just inside the box five minutes after the break to double the lead. Exclusively used off the bench this season, Shekiera Martinez claimed her third goal of the season 11 minutes after her introduction. The teenager at the front of a swift counter that saw Jackie Groenen release the ball for Laura Freigang, the in-form attacker’s square pass enough to take the defence out of the equation and leave Martinez with a simple low finish to beat Anneke Borbe. The lone goal not enough to turn the tide. After a scoreless first half that saw the visitors have a goal ruled out for a foul and both sides hit the woodwork, it was the Sport Club who took the lead after the break, Shannon Beck’s penalty too good for Lisa Schmitz. However, it didn’t take long for the parity to be restored when Potsdam won their own penalty three minutes later. Felicitas Rauch guilty of conceding a spot kick at one end, atoned for her error, sending Merle Frohms the wrong way – although both penalties seemed soft. In one of the stranger games of the season it was the visitors who clinched all three points late in the day as another match saw a super sub’ make a near-instant impact. Lara Prašnikar’s goal less than five minutes after coming on, enough for Potsdam to inch ahead of Essen into third in the table. Up against a porous Bayern, it didn’t take the Wolves long to claim the lead in Leverkusen, Nilla Fischer’s ball over the top just right for Ewa Pajor to bring down and slot into the waiting goal. The Pole didn’t take to wait too long for her second of the game, the young attacker rising well at a corner ten minutes later to nod Caroline Graham Hansen’s whipped ball in. Two became three on the stroke of half-time when the Norwegian arrived at the back post to volley Sara Björk Gunnarsdóttir’s flashed ball beyond Anna Klink. The goals didn’t stop after the break and Pajor soon had her hat trick, finishing off a round of head tennis at a deep free kick. The match wrapped up by Pernille Harder on the hour when she powered a header over Klink and into the back of the net. 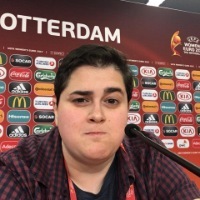 Taking an unexpected lead four minutes in in Munich, Lea Schüller’s chested goal was only enough to separate the two teams for half an hour before Jovana Damnjanović got the hosts back on terms. Ramona Petzelberger restored the lead for the visitors with a rocket from range on the hour but the mounting pressure from the hosts finally told when, at the death, Fridolina Rolfö’s ball across deflected off Marina Hegering and in. The draw enough to put Bayern a half step behind Wolfsburg and Essen a touch back from third.